Kimi Raikkonen might not have heard that old joke about the much-maligned car, an icon of the Soviet era, but it might give him a chuckle. “I had a Russian Lada,” the Formula One star revealed as he took CNN’s The Circuit for a spin in a flashy sports car provided by his team Ferrari. “I got it from a friend of ours. We changed the engine. It was perfect for us — free of charge and a very robust car. The Finn now drives one of the world’s fastest vehicles on the F1 racetrack — which he definitely wouldn’t be allowed to paint black — but the down-to-earth approach of his first car beautifully sums up his underlying normality. The man they call the “Iceman” is Formula One’s most reluctant star. The 34-year-old is known for his succinct, cool answers when facing the media. And while he doesn’t say much, he often says what he thinks. Perhaps his most famous admission came in 2006 when he explained he missed the presentation for the retiring Michael Schumacher, the man he was going to replace at Ferrari the following year, because he was in the bathroom — or words to that effect. Then there are the off-track headlines, like the time he was filmed falling off a boat during a party. Raikkonen’s pithy comments and antics have made him a cult icon among F1 fans but he insists he would rather stay out of the spotlight. “It’d be perfect to lead a normal life where nobody notices you,” he tells CNN. “But obviously you cannot have both. “Racing and driving is the main thing but there’s a lot of other stuff that comes with it. “I’ve been long enough in the business to know that it’s a big part of it. For me, it’s not much fun. Unlike many other drivers on the grid, Raikkonen is also refreshingly honest about his childhood ambitions while growing up in the city of Espoo. “I wouldn’t say I wanted to become a Formula One driver straight away,” he explains. “I actually started out with motocross when I was a small boy and then go-karts. It was good fun and you start wanting more. “But I still didn’t believe that I would even make it to F1 because we didn’t have the money. That something else was two titles in the British Formula Renault Championship. After just 23 races, Raikkonen was signed up by Sauber and fast-tracked into F1 for the 2001 season. He won his first grand prix with McLaren in 2003 and his first and only world title with Ferrari in 2007 before the Italian team effectively paid up the rest of his salary to bring in Fernando Alonso for the 2010 season. Officially retired from F1, Raikkonen flexed his driving muscles in the World Rally Championships and got behind the wheel for two NASCAR races. “I really enjoy the whole NASCAR thing,” Raikkonen recalls. “It’s just completely different and fun. It was a good experience. For now, F1’s reluctant star is focused on finishing his second spell in the sport with Ferrari, having returned to Maranello after two seasons with Lotus in which he re-established himself on the grid despite the team’s financial problems. The 34-year-old, who has struggled with an under-performing car this season, says he plans to finish his career with the Italian marque but is giving nothing away on when exactly that might be. Four-time world champion Sebastian Vettel is expected to sign for Ferrari next year, with Alonso tipped to return to McLaren. “I have a contract for next year and probably for one more year,” Raikkonen says. “But I’m not a young guy anymore. “I want to do something more with my life than just Formula One. I will finish my career in Ferrari. A new chapter is about to begin for Raikkonen in the near future when his girlfriend Minttu Virtanen gives birth to their first child. Raikkonen might not be keen on small talk but he is looking forward to discussing fatherhood with Vettel, his closest friend in F1, who became a father to a baby daughter earlier this year. “The guy I have most to do with outside of racing is Vettel,” he says. “The rest I don’t really see as friends, I race against them. He might be one of F1’s most-enigmatic and best-loved stars, and still among the highest earners, but in many ways he has stayed true to his roots. Dare we suggest, Raikkonen might have rewound time by swapping a Ferrari for a beat-up Lada? Yep..you only lost a wife. 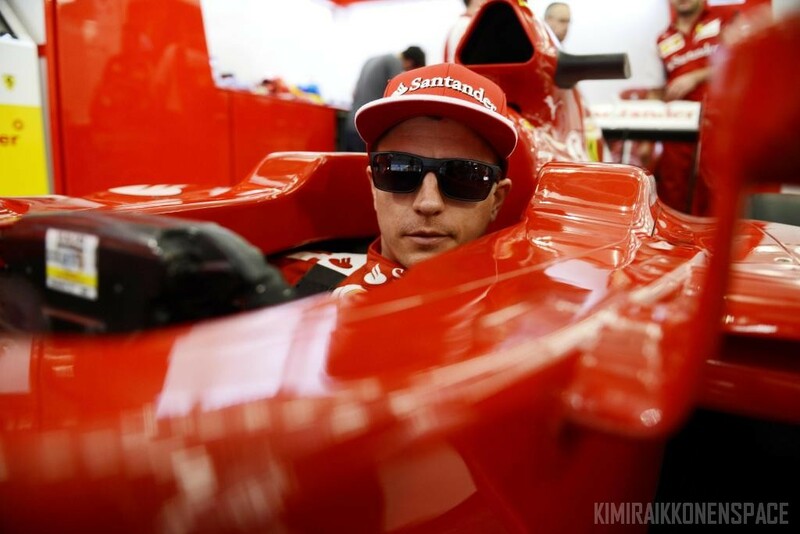 Next #Kimi35 Happy Birthday Kimi!